Crop raiding is a phenomenon influenced by several attributes of the habitat or landscape, climate, foraging strategies, and behavioral ecology of the elephants. These factors are not mutually exclusive, but are interrelated in a complex fashion that is poorly understood. For the purpose of this discussion, I broadly categorize these factors as proximate causes or ultimate (evolutionary) causes, although I must emphasize here that this division is not always clear. 8.2.6.1 Habitat features and the proximate causes of raiding There is obviously a certain historical element to crop raiding by elephants in a given region. Let us imagine a large expanse of natural habitat with human settlements and cultivation only along the periphery in the distant past. Some of the elephant herds or bulls would have home ranges that would bring them into contact with the periphery, while others would range entirely over the interior. The former could indulge in some crop raiding, while the latter would be oblivious to the presence of an alternative source of food plants. The incursion of settlements and cultivation into this hitherto natural habitat would bring more elephants into contact with crop fields. If a part of the home range of such a nonraiding elephant herd is now transformed into cultivation, this herd would initially continue to treat this as part of its range and feed on the crops. In the course of time, the confrontation between these elephants and people would result in one of the following outcomes: the elephants shift their range partially or entirely to avoid conflict; the elephants are eliminated; people abandon the area to avoid conflict; or elephants and people coexist at a tolerable level of conflict. The outcome would depend on human cultural factors, the behavioral decisions of the elephants, the availability of alternative habitat for the elephants, the presence of other elephant groups in the region, and even the demography of the elephant herd or population. 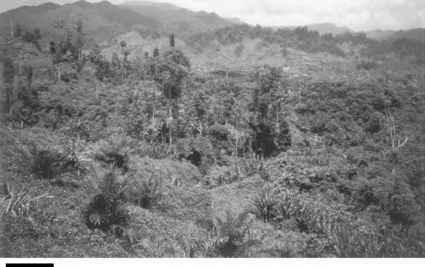 Rain forest cleared for a new oil palm plantation in the Aceh Province of Sumatra, Indonesia. The rapid loss of forest has fragmented the elephant's habitat on this island. and the establishment of the Handapanagala sugarcane plantation within former elephant range in southern Sri Lanka are some recent examples from Asia. The response from the elephants has been swift and dramatic—a sharp escalation in raiding and manslaughter. The elephants may also be attracted by weedy plants such as grasses that invade the open areas. However, the principle of continued utilization (now crop raiding) of their former natural habitat by elephants, which show a certain fidelity to their home range, is clear. Raiding in some instances seems related to diurnal or seasonal movements of elephants, in particular the family groups. Elephants need water, if not daily, at least every 2 or 3 days. When crop fields intervene between the natural habitat and the water source, the resulting damage is inevitable. James Allaway observed that damage to crops in new agricultural areas along the Tana River in Kenya was essentially due to elephants passing through to drink at the river. In my southern Indian study, there were several instances of elephant herds trampling and feeding on crops and then heading toward a pond or reservoir in agricultural areas at night. It is difficult to ascertain whether the primary motive in such cases was a quest for water or for attractive crop plants. Elephants can possibly smell moisture-laden air from large bodies of water and move toward them. Some crop raiding is thus incidental. Where elephants show distinct seasonal movements to optimize the use of different habitats (see chapters 4 and 5), a relationship with crop raiding also emerges. Over most of the elephant's range in southern India, the habitat is a mosaic of diverse vegetation types arising from a sharp topographic and climatic gradient. Many elephant herds or clans here show distinct seasonal preferences for particular habitat types. Some of these raid available crops in settlements located within or along the periphery of such habitats. In other words, the basic pattern of seasonal movement of the concerned elephants is natural under the circumstances and is geared toward optimizing their feeding in the wild. At the same time, the elephants opportunistically indulge in raiding crops. This is not to say that elephant herds do not deliberately raid crops. The movement strategy of some herds could certainly be primarily geared toward raiding. This brings me to another interesting pattern in raiding that can perhaps be explained by proximate considerations. As a landscape becomes more fragmented and its ratio of the perimeter of the forest-cultivation boundary to forest area increases, the frequency of raiding by elephants also increases. 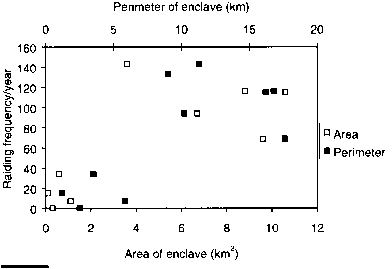 The total number of raids over a year by bull and family groups in 10 enclaves of cultivation in the Biligirirangans during my study was positively related to the size of the enclave and also its perimeter (fig. 8.5). In a later study, Cheryl Nath and I looked at the frequency of crop raids in all villages in the Kodagu District, also in southern India, during 1992-1996. When these were plotted on a map, we found the frequencies to be clearly higher in places where the forest was more fragmented or patchy (fig. 8.6). The total number of crop raids during March 1981-February 1982 in 10 enclaves in the Biligirirangans in southern India in relation to area of enclave and perimeter of the forest-cultivation boundary. vated land. It is then natural that the elephants indulge in some opportunistic raiding. At the same time, the forest fragments also provide convenient daytime shelters to indulgent crop raiders that venture out into the surrounding agricultural lands at night. The status of the natural vegetation in areas bordering cultivation or, indeed, the entire landscape mosaic may also have a bearing on raiding. It is often speculated that "degradation" of the natural habitat is responsible for crop raiding by elephants. The term degraded has to be used carefully. What seems degraded from a human viewpoint may not necessarily be so from the elephant's perspective. Secondary vegetation with weedy food plants may actually be more attractive for elephants than the corresponding primary habitat. Degradation in our context should thus be used to denote a reduction in food resources for elephants. Even then, it is not clear that habitat degradation in the immediate vicinity of a cultivated tract would increase the frequency of crop raids. The opposite may also be true. In the course of their movement into the more favorable foraging habitats, elephant herds may make increased contact with cultivation in the vicinity. In his study at Hosur, Ramesh Kumar found that villages situated near superior habitats experienced more raids than those near degraded habitats. large spatial scale of the home range of a clan or population, a degraded habitat may increase pressure on elephants to seek a part of their forage requirements from cultivation. This, however, is not a proximate factor, but should be considered as ultimate causation within the framework of foraging theory. 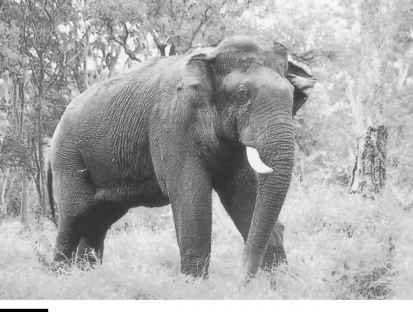 The only detailed study so far of the relationship between habitat features and crop raiding by elephants at the scale of a large landscape has been that of Richard Hoare during 1993-1995 in the northern Sebungwe region of Zimbabwe. This region of about 15,000 km2 is a mosaic of protected areas for wildlife (national parks and safari areas) and communal lands with varying extent of human settlement. 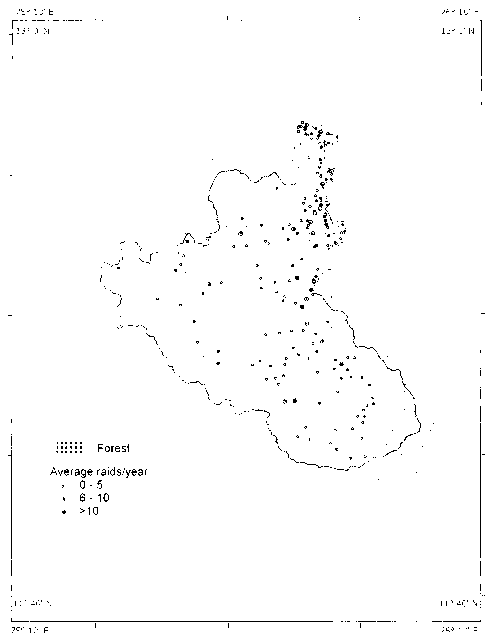 Using data on raiding frequencies and elephant densities from aerial counts in various administrative units or "wards," Hoare also factored in other variables, such as annual rainfall, the frontage of protected areas, human densities, settlement area, and ward area to analyze statistically the possible determinants of crop raiding. Surprisingly, he found that none of these factors could adequately explain the intensity of conflict (table 8.1). There was only a weak association of raiding intensity with elephant density and protected area frontage. Rather, the incidents of crop raiding were irregular and unpredictable, showing considerable variation from one year to another. One reason for this pattern is that most of the raids were by bull elephants; the ensuing elephant-human conflict was thus dependent on the "behavioral ecology of individual bull elephants." More studies of this type at the scale of landscapes are needed before the relationship, if any, between habitat attributes and crop raiding can be better understood. Percentage variation for association between variables and problem elephant incidents in 21 wards in Sebungwe, Zimbabwe, during 1993-1995. Source: From Hoare (1999). 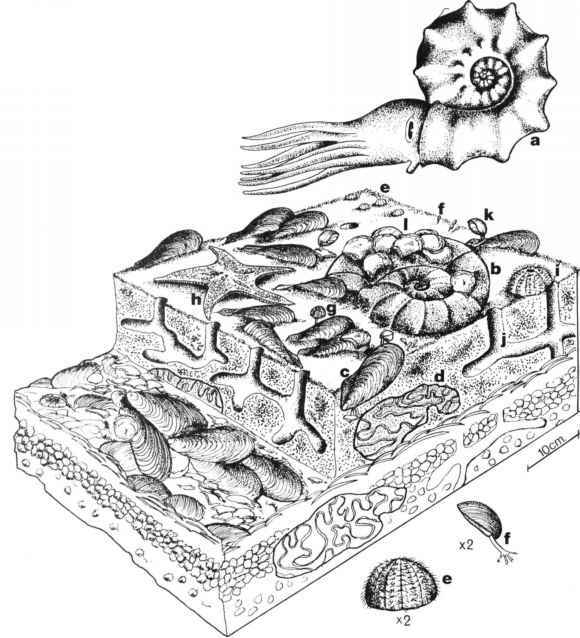 Reproduced with the permission of the British Ecological Society. The data were transformed as log (incidents +1) and expressed as the coefficient of determination r 2. *Settlement coverage only for 15 wards with resident elephants. phant. In ultimate or evolutionary terms, a particular foraging strategy, including crop raiding, is beneficial only if it confers a higher fitness on the individual. It pays to raid cultivated crops if the crops provide better nutrition than feeding on wild plants. Since the advent of agriculture, humans have selected plants for their higher productivity, low toxicity, sensory qualities, and superior nutritive properties. It is therefore not surprising that elephants have also taken advantage of this human-influenced selection in their foraging decisions. In simple quantitative terms, an elephant can generally feed on cultivated grasses at a higher rate than it can on wild grasses. The reasons for this are obvious. A cultivated field provides a concentrated source of food plants, which are much more dispersed in the natural habitat. At a feeding rate of 12 kg (dry weight) per hour in a millet field, an adult bull elephant can meet its daily requirement of forage in about 6 hours. It is doubtful whether this rate can be achieved in the wild except in the most productive moist grasslands. When elephants enter an oil palm plantation, they can quickly move from one plant to another rather than spend time searching for widely dispersed palms as in the wild. Comparison of nutritive content of cultivated crops and their analogs among wild forage. Sources: Based on Sukumar (1985, 1989a) and Osborn (1998). All comparisons for second wet season (southern India) or late wet season (Zimbabwe) and for plant parts consumed during this period. higher protein levels of 5%-10%. Maize cobs, which are selectively plucked by elephants, had protein levels even higher than in fresh growth of tall grasses (all below 10%). Short grasses are more palatable and nutritious than the tall grasses, but even during the late wet season, they do not provide the bulk forage required by elephants. Similarly, the levels of two minerals, calcium and sodium, were also substantially higher in the millets and paddy. I recorded calcium levels several-fold higher in finger millet plants compared to the bases of wild grasses. Sodium contents in flowering finger millet and paddy were again much higher than in all other wild plants, both grasses and browse, analyzed. The only other comparison of the nutritive qualities of cultivated crops and wild forage plants comes from Ferrel Osborn's study in Zimbabwe. He found protein levels in crops to be significantly higher than in wild grasses and browse during the late wet season, when most of the raiding occurs, but not during the early wet season. Further, the palatability of crops was also higher, as deduced from its lower fiber and lignin contents compared to wild grasses. Both in southern India and in Zimbabwe, the rise in crop-raiding intensity seems to occur during the transition from the late wet season to the early dry season. This is also the period when elephants gradually switch from a predominantly grass diet to one with more browse as the protein level in the wild grasses declines. It has been suggested that a mixed feeder such as the elephant has to shift from one plant type to another, such as from grass to browse or vice versa, gradually in order to maintain the correct microbial composition for ensuring proper digestion. If this were the case, then elephants could be obtaining the correct mix of grass (from cultivated sources) and browse (from the natural habitat) during this transitional period. Clearly, more investigations in a variety of situations are needed before the influence of the differential nutritive values of wild and cultivated plants in crop raiding can be clearly evaluated. Habitat degradation over the home range of an elephant group would further widen the gap between foraging efficiency in the wild and in cultivated land. This may further encourage crop raiding. Elephants living in the relatively resource-poor evergreen forests may find paddy or sugarcane fields even more attractive than those inhabiting deciduous forests or moist grasslands. One prediction that can be tested is that elephants in rain forests would raid crops more frequently on a per capita basis compared to elephants in savannas, woodlands, or moist grasslands, provided that other factors (degree of habitat fragmentation, elephant density in relation to the "carrying capacity," and so on) are kept constant. Finally, we need to ask the question as to whether elephants really need to raid crops even when they have sufficient wild forage to meet their normal nutritional needs. There are several examples of small elephant populations, inhabiting expansive habitats providing a surfeit of resources, coming into conflict with agriculture. The explanation may lie in the physiological mechanisms that influence foraging choices. Animals use their senses, particularly taste and smell, to decide whether to accept or reject a potential food item. Each species has presumably evolved the sensory mechanisms appropriate to its particular needs. Sweet, salty, or bitter tastes, for instance, each convey specific information to sensory receptors in the brain about the nutritive attributes of an item. This would have been evolutionarily adaptive; the sweet taste in humans is believed to have evolved for feeding on fruits that are rich not only in sugars, but also in other nutrients. It is well known that the synapses or junctions of the nervous system need regular external stimuli for reinforcement. A positive stimulus is associated with "feeling good." This explains why regular doses of such stimuli could also soon end up in addiction. A child brought up on an excessive diet of sweets would continue this habit into adulthood even if there were no real nutritive advantage (indeed, a "sweet tooth" has several adverse effects on health). Thus, not only children, but also adults may prefer cakes to plain bread when offered a choice at a party (unless they are diabetic, of course!). A crop plant that is richer in nutrients than wild forage conveys superstimuli to receptors in a herbivore's brain. Once an elephant tastes cultivated crops, it may develop an addiction for the same, irrespective of whether it actually needs those extra nutrients. A sugarcane field is an irresistible attraction, even if the overload of sugar may not do the elephant much good. There are several features of crop raiding for which we must seek explanations in the behavioral ecology of male and female elephants. One feature is the strikingly higher propensity of bulls to raid crops (fig. 8.7), while another is the heterogeneity among bulls and family herds in their inclination to raid crops even when they have access to cultivated fields. It is well known that males and females of a species may differ in behavior because of contrasting factors that influence their reproductive success. Robert Trivers has pointed out that, in polygynous mammals, the male is more likely to indulge in risk-taking behavior that promotes reproductive success. The elephant is a polygynous animal, with the sexes showing marked dimorphism in body size. Crop raiding involves taking considerable risks as farmers may injure or kill raiding elephants. The actual risk to a raiding elephant varies according to local cultural perceptions and laws. From records of elephants killed directly during crop raiding and the ratio of raids by bulls and family herds in southern India, I found that the risks to the sexes were virtually identical. As the average adult bull raids crops much more frequently than does a female-led herd, it follows that the male is more willing to take risks to obtain nutritious forage. A large bull Asian elephant in Mudumalai, India. In relatively intact habitats, the adult male elephants seem far more likely to raid crops compared to family groups. or later in adult life as they continue to gain weight (appendix 2). A larger body size would confer an edge to a male during competition with other males. Good body condition is also important for the successful expression of musth in a bull elephant. During musth, a bull is dominant over nonmusth bulls, including older ones, and this greatly increases its chances of mating with an estrous cow (see chapter 3). In 1988, I published an article along with Madhav Gadgil suggesting that the increased tendency among male elephants to raid crops was the consequence of a "high-risk, high-gain" strategy, molded by natural selection, to enhance reproductive success. We clearly recognized that a crop-raiding strategy would not automatically be translated into better reproductive success. Raiding entails considerable risks, and the levels of risks have varied with human technological and sociocultural changes. The risks to an elephant from a trigger-happy farmer are obviously vastly different from the risks associated with one who worships an elephant's footprint in his field. Over the elephant's distributional range in the two continents, the reaction of local communities to elephant depredation varies from vicious retaliation to resigned tolerance. Raiding itself is a behavior acquired over the past few thousand years, clearly insufficient for the natural evolutionary process to select a particular trait. Crop raiding could eventually be a losing proposition to its perpetrators. A raiding bull could be injured, and thus lower its chances of coming into musth, or even be killed in the process. Nevertheless, it is not unreasonable to assume that a notorious bull is only manifesting natural risk-taking behavior that has evolved over the ages. Female elephants, along with their families, also raid crops, but we must seek alternative explanations for their behavior. A basic explanation for raiding can obviously be found in foraging theory. After all, females also have their extra nutritional needs, such as during pregnancy and lactation. When families raid crops, the matriarchs have to consider not only the risks to themselves, but also the risks to their closely related kin. In the balance, it may not be worthwhile for female elephants to take the same levels of risks as bulls. Could the needs and behavior of subadult males that have not yet separated from the family drive some of the raiding by family groups? The most visible and spectacular instances of raiding by family herds seem to be associated with long-distance dispersal by these animals. The dispersal of several elephant herds from the southern Indian states of Tamilnadu and Karnataka into Andhra Pradesh, where elephants have been absent for over two centuries, can be attributed to a combination of habitat and climatic factors. Habitat denudation in their original home range could have contributed to the dispersal. It was, however, no coincidence that the first wave of dispersal took place in 1983, after southern India had experienced one of the most severe droughts of the century related to a persistent El Nino, which disrupted climatic patterns globally. Subsequent dispersal by smaller groups did occur, but another major unsuccessful attempt occurred in early 1996 following the failure of winter rains the previous year. Some of the herds that originally dispersed have now moved over a distance of 200-300 km from their original home. Another example of long-distance movement by elephant herds is from southern Bihar into southern West Bengal in India during the late wet season extending through the winter. In this case, the 50 or so elephants have not completely shifted their home range, but rather have altered their seasonal movements to utilize a new and substantially larger range (chapter 4). There has been severe conflict with agriculture in this process, which has been studied by Hemant Datye and later by Sushant Chowdhury and his colleagues. The first decisive foray from Bihar deep into West Bengal took place in 1987, which was interestingly another drought year in the subcontinent. Ironically, the decision of the elephants to expand their wet season and winter range seems to have been aided by the success of a forestry project in West Bengal, under which large patches of denuded forest have regenerated in recent years. These have provided convenient cover during the day for elephants, which then raid the surrounding crop fields at night. Crop raiding by family groups therefore seems to be influenced in many instances by their need to seek an alternative habitat when their original home range is unable to sustain their resource needs because of human influence or an adverse climatic event. Such herds may already be utilizing marginal habitats and coming into conflict with agriculture. For long-ranging animals such as elephants, their dispersal into new habitats could have been evolutionarily adaptive in pre-human-dominated landscapes. Elephants are today only manifesting such inherent behavior. The need to avoid competition with more socially dominant family groups in the area, an aspect that is poorly understood, could also influence the decision to disperse under times of stress. It must also be kept in mind that, during such long-distance dispersal by family herds, they may be accompanied or followed by adult bull elephants. This takes us to the issue of behavioral heterogeneity among elephants in their tendency to raid crops. Why do certain elephants, either adult bulls or family herds, become notorious raiders, while others rarely, if ever, raid crops, even when they have easy access to agricultural fields? In a highly social, intelligent animal, considerable heterogeneity in a variety of behaviors, including crop raiding and response to humans, can be expected. Crop raiding entails taking certain risks. Individuals have to make decisions as regards the levels of risk they are prepared to take in relation to possible benefits they could derive from a course of action. In a higher, more intelligent mammal, the brain has the capacity for longer-term memory, discrimination between different patterns of stimuli, and a nonstereotypic response that draws on its complex episodes of learning. Sociobiologist Edward Wilson terms such a mammal a "generalized learner" possessing a "perception of history." Presumably, elephants that have made contact with agricultural fields would have attempted at some stage to feed on crops. The decision then to persist with or opt out of raiding would depend on how individual elephants or the matriarchs of herds, each with their distinct behavioral personalities, evaluate the risks of confronting humans. As with foraging choices in the wild, learning within the family setting obviously plays an important role in crop-raiding behavior. Young male and female elephants could thus learn to raid crops from the adult cows in the family. Such behavior could then persist in succeeding generations through cultural transmission. The opposite would also be true. Among elephant clans, this could give rise to raiding and nonraiding (or relatively so) clans. Pubertal males dispersing from raiding herds could turn out to be notorious raiders themselves, while those from nonraiding herds may not raid unless they learn this through association with raiding males. Among family herds, there is a possibility that their competitive interactions with herds of other clans, for use of natural habitat, could influence raiding behavior. The home ranges and foraging strategies of clans could be influenced by the outcome of such interactions. Only through following the movement, foraging choices, and dispersal patterns of elephant clans and bulls over the long term can the complex interplay of factors that influence their interactions with humans and agriculture be unraveled.